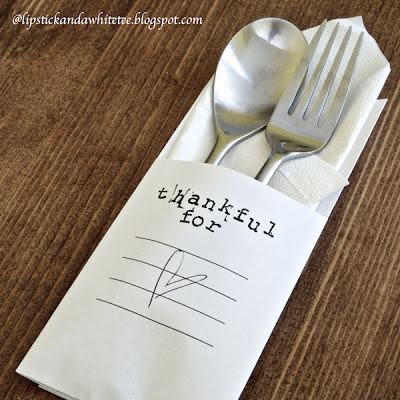 I am all about keeping the Thanksgiving place settings interactive, especially at the kids table, and these Thankful For place settings are a great (and super easy way) to let your guests jot down what they are thankful for and keep their hands busy while the turkey is being carved. You can check out how to make (and fold) these DIY Thanksgiving place settings over at Lipstick and A White Tee. Thankful for you sharing my project :) how fun!